Your group will love our log cabin that is completely secluded on over 7 acres without another cabin, house or building in sight and it has gorgeous views of Shadow Mountain Lake and the mountains. Although secluded we are only 1 mile to the entrance of the town of Grand Lake and 1.5 miles to the entrance to Rocky Mountain National Park. The cabin is very spacious with over 3,200 square feet with 3 bedrooms (3-King, Queen & twin over twin bunk beds - sleeps 10) and 2 full bathrooms with a fully finished walk out basement. From our wrap around deck relax & the wildlife visitors including: elk, deer, moose, fox & osprey. At night enjoy the breathtaking view with many thousands of stars and the Milky Way (no light pollution = no close neighbors). Enjoy our brand new (June 2018) HOT TUB, WIFI, Outdoor Woodburning Fireplace, Horseshoe pit, Ping Pong, shuffleboard table , Playground, X-box, dvd movies, toys, games, outdoor games (bocce ball, jarts, basketballs, footballs, etc), books, washer/dryer, 3 King, 1 Queen & twin over twin bunk beds, 3bedrooms/2 full baths, gas stove/oven, Kuerig & regular coffee maker, Kitchen Aid mixer, popcorn maker, griddle, coffee grinder, crockpot, 3 tvs have satellite on the main floor & basement family rooms & upstairs bedroom, other 2 bedrooms have tvs with movies (provided) or Netflix. Fully finished basement. Grand Lake and Rocky Mountain National Park: Grand Lake is quaint village on the shores of Colorado's largest natural lake and the western entrance to Rocky Mountain National Park. With Shadow Mountain Lake & Lake Granby there is more than 150 miles of scenic shoreline to explore, hike or fish. The Grand Lake area has plenty to do including: boating, sailing, fishing, hiking, golfing, hot sulpher springs, shopping, live theater or just enjoying the warm sunny days and cool evenings in the summer. In the winter you can enjoy snowmobiling, cross country & down hill skiing, hot springs, snow shoeing, sleigh rides, dog sled rides & sledding. In the fall you will appreciate the smaller crowds & the aspen leaves that turn a golden yellow & great wildlife viewing as the elk & moose make their way down from the mountains. You can also admire the elk bugling/mating season – simply a must see/hear! Amenities: Indoor gas Stone Fireplace, Hot Tub, Wireless High speed internet access, outdoor wood burning fireplace, Kids Playground, Xbox & games, port a crib & a stroller, high chair, bouncy chair, boppy pillow, Children's movies, Games, books, Toys, SHUFFLE BOARD table, ping pong table, 2 pairs of adult snowshoes, many different sized ice skates, sleds to sled down our driveway, tennis rackets, phone, 3 Satellite TVs, tv's in all 3 bedrooms with movies (provided), VCR, CD Player,DVD player, Full Kitchen, s/s Microwave, Dishwasher, Refrigerator & convection/gas oven/stove, Cooking Utensils provided, kitchenaid mixer, Regular & Keurig coffe makers, Linens provided, 3 King and 1 Queen Beds, twin over twin bunk beds, Washer & Dryer, Fully finished Basement, Large Deck w/ Gas Grill (BBQ), Horse shoe pit. In the winter you need 4WD/AWD and good tires or chains at a minimum to get up our driveway (it is plowed on a regular basis). No Smoking, Pets, camping, campers & No Weddings. The Village of Grand Lake is in the Colorado Rocky Mountains, less than 2 hours west of Denver. The village sits on the shores of Grand Lake, overlooking Rocky Mountain National Park. With nearby man-made Shadow Mountain and Granby Reservoirs, the three recreational lakes offer more than 150 miles of scenic shoreline for camping, fishing or hiking. One of Colorado’s first vacation communities, Grand Lake is no stranger to making folks feel at home with its charming lakeside village setting. You will enjoy the quaint cabins and summer homes dotting the shores of Colorado’s largest natural lake. **Please check rates for detailed pricing. If you are asking far in advance & we do not have the pricing updated the nightly rate defaults to our highest nightly rate - please understand this is not the nightly rate - email me for the correct nightly rate. 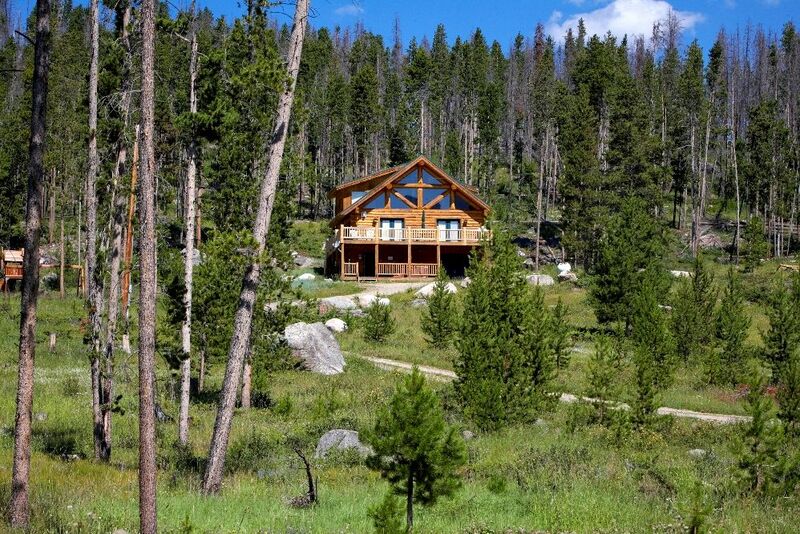 *Note: this cabin is in Grand Lake, Colorado. Vrbo/HomeAway recently lumped Grand Lake with Estes Park (2-4+hours drive summer/winter), Winter Park, Fraser, Tabernash & the town of Granby (20-50 min drive). ZOOM IN ON MAP TO GET JUST GRAND LAKE. We moved from Ohio to Littleton, Co 24 years ago & bought our 1st place in Grand Lake 20 years ago. We have 3 boys: twins that are in their 20's & a teenager. When they were younger they loved to go to the cabin & catch frogs, butterflies, grasshoppers, play on the swingset, enjoy the wildflower or just hang out on one of the big rocks to have a picnic. We love the quiet town of Grand Lake we enjoy boating on the 3 large lakes & hiking in Rocky Mountain National Park. We often have picnics by one of the lakes & our boys love to just hang outside & see the wildlife. Seclusion, privacy & close proximity to town (1mile). We keep condiments in the refrigerator. We have stainless steel appliances and a convection oven option. Stainless steel gas range with convection option. Plenty of dishes, cups, wine glasses & silverware. Dining room table with 8 chairs plus 4 comfy bar stools at the kitchen island. Lots of kid & adult books & magazines. Many board games & puzzles. Blue tooth speaker to play your own music. One in basement family room & one on main level family room. Extensive video & dvd collection. Two large decks with fantastic lake and mountain views. Table with 6 chairs & 4 Adirondack chairs. In the winter sled down our 900' driveway. Lower deck with hot tub & small table & 2 chairs. Ski Granby Ranch - 20 minute drive. Winter Park - 45 minute drive. Cross country skiing 5 minute drive. Nearby - 10 minute drive & we have tennis rackets & tennis balls for your use. Grand Lake golf course 10 minutes away. Three other courses withing 15-30 minute drive. We have an outdoor wood burning fireplace, a horse shoe pit, hot tub, tennis rackets, 2 pairs of adult snowshoes & many sizes of ice skates, outdoor games (bocce ball, jarts, basketballs, footballs, etc), sleds to sled down our driveway & ping pong and shuffle board table for your enjoyment. In the winter you need 4WD or AWD (and good tires) to get up the hill/driveway to the cabin. *Note: this cabin is in Grand Lake, Colorado. Vrbo/HomeAway recently lumped Grand Lake with Estes Park (2-4+hours drive summer/winter), Winter Park, Fraser, Tabernash & the town of Granby (20-50 min drive). ZOOM IN ON MAP TO GET JUST GRAND LAKE. We just left this beautiful home after a 4 day stay. It wasn't nearly long enough! Only half of our family was able to join us this year but we're definitely planning on returning with the rest. The view was unbelievable! The house was more than what we expected; tons of space, fully accommodating to our every need. Thank you so much for sharing this amazing home with us! We had an absolutely amazing time. We went up with my in-laws and our three kids (6, 6, 4). We loved sledding in the yard, and of course our daily dips in the hot tub. The views are spectacular, and were even able to snowshoe up the property a bit. The house is fully stocked and very well kept inside. We played lots of games, relaxed, and made some great memories. Although we didn’t see any animals we were always on the lookout. We are looking forward to going back again soon! Lovely home with amazing property & view. The home is comfortable and well kept, with many helpful items for your stay. The property is great for snowshoeing, sledding and snow fort building. What fun! Plenty of entertainment inside and outside the home for all, adults and kids alike! The view from the deck is not to be missed! A wonderful winter retreat!! We stayed at this property for our kids spring break and it had MORE than anything we could have ever hoped for in a vacation getaway. This was our first "snow" vacation and we ended up getting stuck in the blizzard. Thanks to all the amazing amenities at the house, we were able to stay entertained and busy while we waited to get plowed out! The downtown area of Grand Lake is also very nice and quaint. We would absolutely stay there again! This is our second time staying at this amazing cabin. Jeff and Maureen are truly the best owners we have ever experienced! They have a wonderful cabin that is set on an impressive piece of property. The cabin was clean, well stocked, and full of entertainment for the whole family. The cabin was close to tons of fun activities. We enjoyed snowmobiling, the Hot Sulphur Springs, tubing, sleigh riding, and much more! We can't wait for stay #3 in the future! Grand Lake is quaint village on the shores of Colorado's largest natural lake and the western entrance to Rocky Mountain National Park. With Shadow Mountain Lake & Lake Granby there is more than 150 miles of scenic shoreline to explore, hike or fish. The Grand Lake area has plenty to do including: boating, sailing, fishing, hiking, golfing, hot sulpher springs, shopping, live theatre or just enjoying the warm sunny days and cool evenings in the summer. In the winter you can enjoy snowmobiling, cross country & down hill skiing, hot springs, snow shoeing, sleigh rides, dog sled rides & sledding. In the fall you will appreciate the smaller crowds & the aspen leaves that turn a golden yellow & great wildlife viewing as the elk & moose make their way down from the mountains. You can also admire the elk bugling/mating season – simply a must see/hear! Golf: The Grand Lake Golf Course is less than 2 miles from our property. Three other golf courses in Grand County. For more information please see the links page on our web site. Ski: Their is nordic skiing less than 2 miles from our property and great downhill skiing within 20 minutes at Granby Ranch or 40 minutes to Winter Park. Summer is Saturday to Saturday only. We usually sell out for the entire summer by the end of January Sorry, no pets, no smoking & No Weddings. **Please check rates for detailed pricing. If you are asking far in advance & we do not have the pricing updated the nightly rate defaults to our lowest nightly rate - please understand this is not the nightly rate - email me for the correct nightly rate. If you do a "book it now" option with the lower rate - I will simply decline.